Years ago I used to gather up my work kids and take a field trip or have a company type picnic. I’m not sure how or what year we got away from doing this or what happened, but this year we decided to gather up the team and restart the tradition. Pappagallo’s has been a satellite beach staple for almost 30 years now but we felt that it was never too late to start a new tradition. 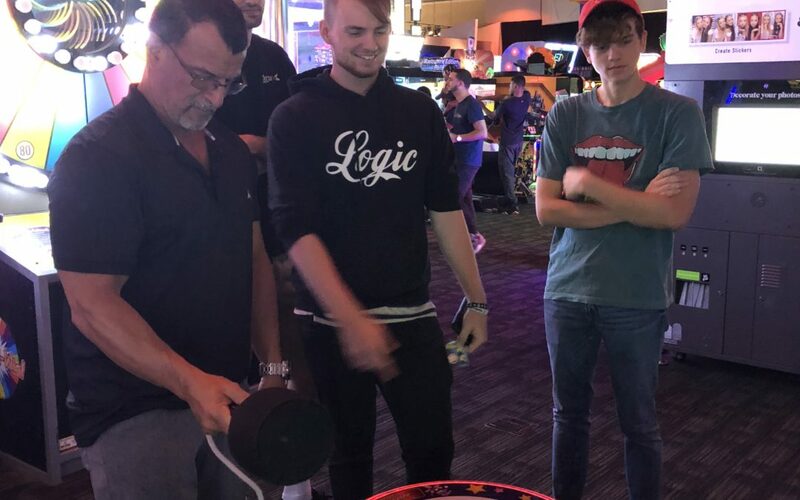 After some careful consideration and some really strange suggestions from the crew (I didn’t feel any good could come of arming everyone with paintball guns so I had to veto that idea) we decided to go to Dave and Buster’s in Orlando. It’s still really hot in Florida around Labor Day so something inside was definitely the way to go. Labor Day came and we loaded up the Pappagallo’s Satellite Beach caravan and headed to Orlando. We lost a few people last minute to other plans or something else coming up last minute (mental note never pre buy tickets or you’re destined to get stuck with unused passes.) The final count ended up at 25. We had a few last minute add ons in the form of girlfriends, boyfriends and even a former team member who moved on to a different careers. Pappagallo’s Satellite Beach crew spends a lot of time together while working their week to week shifts. I always overhear about their after hour escapades. Honestly most of the time I wish I didn’t… LOL. Our staff always interacts well with each other and our guests but I have to say it was fun to watch them outside of work just being the young people they are. Some are old enough to enjoy some adult beverages,and they do. While the under age staff had a blast collecting and cashing in tickets they had won by mastering various arcade games. The nicest part for me was seeing everyone enjoying themselves outside of work and the fact that I didn’t have to check my phone every 5 minutes because anyone who would call me was already there. Pappagallos isn’t a job for me it’s a lifestyle. So even when you’re not at work it doesn’t mean that your phone can ring at any minute, and whatever you were doing has to take a back seat to what needs to be done at work right now. I’m fine with these guidelines as that’s the way life has been since 1990 when we first opened Pappagallo’s in Indian Harbour Beach. Pappagallo’s Satellite Beach does close a few days a year (mostly for major holidays.) Those are the days when we are truly off work. I do have to confess that most of those days I do go by at least once to make sure nothing went haywire while no one was there for that whole day. That may sound weird but let me ask you a question, when does a water heater break and flood your house? Always when you’re not home or you take a few days to get away for a few days, and that’s the exact time that the water heater turns into a fountain and floods your house. Pappagallo’s Satellite Beach crew hung out for about 4 hours at the game place. We battled aliens. We played skee ball and even tried a virtual reality Jurassic park game. Just good old mindless fun. After we left the game place we decided to go get dinner. Some of the crew had already headed home because they had plans for the holiday evening. My wife and I waited outside for the remaining crew to arrive at the restaurant. While we were waiting, my daughter pulled up to inform us that the wait for a table would be about 90 mins. That was excuse enough for me to head on home. The reason I tell you that part of the story was to demonstrate how these Pappagallo’s Satellite Beach “kids” look out for each other. One of the girls was riding back with some or the older kids who had decided to have some wine and wait out the 90 min wait for a table, this girl is underage to drink and works at another job that she had to be at at 7:00 am the next morning. Basically she needs to get home but it looked like it was going to be a very late night for her. She really didn’t want to spoil the night for her older coworkers so she was going to stick it out. Another team member who has since moved back to Orlando for school, heard about this and volunteered to let her spend the night with her and drive her back first thing in the morning to work her other job. I was proud of the girl who was stuck but didn’t want to ruin her older coworkers good time and especially proud of the latter girl who offered her the ride because it was the right thing to do even though it was time out of her day that she really didn’t have to give. Its kinda cool that the driver who provided the impromptu slumber party is also my daughter, Krista . So the net morning we all returned to life a usual at Pappagallo’s Satellite Beach, the staff that attended the field trip were genuinely excited about having went and I get the feeling the ones who couldn’t make felt a little disappointed that they missed out. One of Pappagallo’s Satellite Beach cooks took me aside and wanted to personally thank me for taking the time to take everyone on a field trip and went on to comment about how fun it was to watch me blowing up alien worlds and trying to out shoot my wife in basketball. That game was rigged by the way, it has to be some kind of estrogen key that man can’t use. It was a really great day, it was fun to hang out with the people you work with outside of work. It was nice that we weren’t rushed to get done, we had all day and we spent it the way we wanted to. Yeah I think field trips may have to become a Labor Day tradition for the crew at Pappagallo’s Satellite Beach, if you’re reading this maybe next year you may want to join us. I don’t want to sound to arrogant but we’re a pretty fun group.